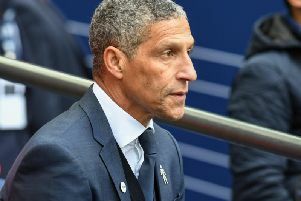 Brighton and Hove Albion boss Chris Hughton said he is delighted that his side have managed to go four games unbeaten. Since losing 2-0 at Bournemouth two weeks ago, Albion have secured away draws at Arsenal and West Ham either side of a win against Everton, before gaining revenge over Bournemouth with a 3-1 FA Cup third round victory at the Vitality Stadium. However, the Premier League side now face two tough games against Liverpool (January 12) and Manchester United (January 19). On his side's form going into the games, Hughton said: "I'm delighted and that's what this league can be. "Generally it's the other way round. Generally, clubs at our level, on the back of a few defeats, are trying to get their next win or draw because this business is tough. "We've got a tough period coming up, in particular the next two games which don't come any tougher than that." In October, Brighton won three games in a row with a scoreline of 1-0, seeing off West Ham and Wolves at home and Newcastle away — their best run this season. Hughton added: "A little while ago we won three games on the spin 1-0 and felt that was a great achievement. "It's very difficult to do in the Premier League. At the moment we are on a nice run and we will hopefully keep that going but we know what the next two games are." When asked if Bernardo would recover in time from a hamstring injury to face Liverpool on Saturday, Hughton said: "In this moment we will have to wait and see. "We're happy that it is not a bad injury. The next couple of days will probably determine how long he will be out for."